The Constitution Place project entails the design and construction of a government and commercial office and hotel precinct adjacent to the ACT Legislative Assembly and Canberra Theatre Centre. The precinct began construction in January 2018. The building works entails two new commercial office buildings and a 3 level underground basement carpark covering some 80,000m2 of development space. A curved curtain wall façade is the main feature of the development having been designed by Bates Smart Architects. Specifically the buildings are 220 London Circuit, also referred to as the ACT Government Office Building, which will contain a ground floor public lobby and business centre space, child care mezzanine levels and five storeys of government offices as well as a top roof level of plant and equipment. The second building is known as Constitution Place and will consist of 12 levels of commercial space including PCA A grade offices and a five-star Adina Grand Hotel with 130 rooms over four levels. Integrated fitouts will be undertaken for commercial office tenants through the development for a number of major tenants. 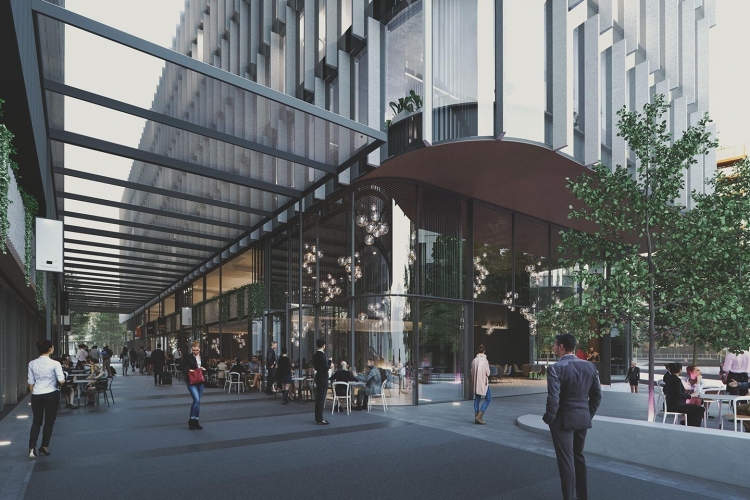 The project will also address external areas such the Legislative plaza, which will be the formal public space in the precinct visually uniting 220 London Circuit with the Legislative Assembly. In addition to this at the intersection of London Circuit, Constitution Avenue and Theatre lane a Pocket Park is to be designed and constructed consisting of outdoor seating and landscaping. Theatre lane will be inclusive of shops and cafes and help stimulate an avid social atmosphere both at night and during the day. There are a number of construction challenges on the site due to the buildings locality to the busy city streets and neighbouring buildings along with the scale of construction which will require tower crane, concrete mast and high rise construction techniques along with the curtain wall façade installation processes.